Thirty-four teams gathered at The Club at Savannah Harbor to honor and help raise funds for the families of our fallen and critically injured first responders. The Chatham County Aviation squad started the tournament with a flyover while bagpipes played in the background and an Honor Guard presented colors. Mark Dana spoke just before the horn blasted to send the carts racing throughout the golf course to begin the play. StayInSavannah.com and Savannah Lodging provided delicious biscuits & gravy and cinnamon buns for breakfast during registration, while Blends provided exquisite coffee, and Coca Cola provided water and orange juice. Paul Kennedy Catering’s and Molly McPherson’s food trucks were strategically placed on the course, so the golfers could have refreshments and fantastic food at perfect intervals, while sipping Service Brewing’s beer or other Coca Cola refreshments. To end the day, a delicious lunch was provided by Belford’s and Savor. Team Coca Cola won again this year with Team Morgan Stanley following close on their heels. 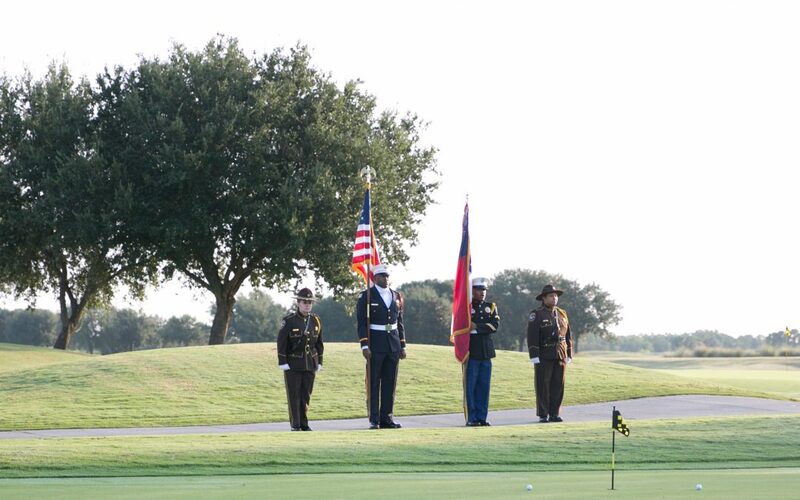 The Golf Tournament raised $25,000 which will all be given directly to the families of first responders. The Two Hundred Club thanks all the companies and individuals who participated either by sponsoring a golf team or a hole sponsorship.